I was seating primers in these cases and came across 3 where the primer made a dead stop at the case head. I tried chamfering (not in photo) with the RCBS deburring tool but the pocket is so badly swaged inward I dared not go deeper than about .015". Something on some firearm breech seems to have impacted the head pretty hard. Notice the imprint of whatever it was around the pocket face slightly off center. Any ideas on what kind of firearm could do this? I'm assuming it was done upon firing. The case is otherwise "normal" in all other aspects. Possibly a full auto weapon? Ammunition specific for full auto has a mighty crimp. They just look like they've been crimped. That takes some energy, higher energy than a typical pistol slide has. Either they had been crimped by Winchester when loaded or they were fired in a sub-gun, but I don't know of any sub-guns that crimp primers. Top secret gov't attack drones carry sub 9mm mini vulcans. The casings could show up anywhere. Snowden confided in a friend of a friend. Or a switch to Jim Beam. As an engineer, I wonder if that was done on the assembly line. The primer is pushed in with a die slightly larger than the primer cap until it hits the case and stops. Same size or smaller die would risk wasting primers. That looks like the die hit the casing perhaps due to a set up error as the assembly line was switched over, or the primer failed to feed, or the case is too long. You may never know what happened. Too bad you don't still have the spent primer in there, that might have given some more clues. I doubt it was due to the gun it was used in. Looks like standard military primer crimp to me. X Ring wrote: Looks like standard military primer crimp to me. Yup, you guys beat me to it. Just crimped military brass. Someone bought some surplus 9mm. There is a tool to trim the crimp out or you can deswage it. For 9mm I'd go with trim. Some LEO ammo has crimped primers too. 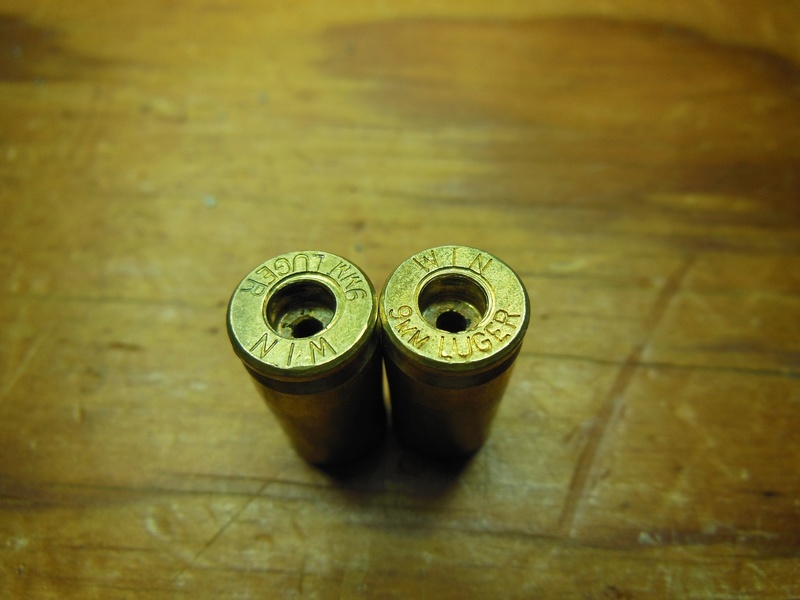 Those look like commercial headstamps, I'd wager they came from a police range, or were surplus police ammo. They already went into my disposable recycle bin after taking the photo. I've got too much good brass to worry about saving those or any others I run into. I like the production error response. Seems more plausible than the 9mm Mini-Vulcan. Thanks for all the responses. Personally, they look normal to me. Could be a standard primer crimp, but not any sign of over pressure/gun damage. Now,you're running off a million military rounds and then switch to commercial. Since this is your "cheap" line, you switch out the cases for the correct head stamp but make no other change. It costs you MONEY to take out the primer crimp equipment from the line and nothing to just leave it alone. So, what do you do? I just got a couple thousand 9mm cases from an indoor civilian range. 90% of the cases had crimped primers, with headstamps from all the American manufacturers. I normally ream crimped cases, but I'm going to have to give in and buy a swager. There's no way I'm going to ream all of those short little-bitty cases. No way, no how. 5.56 cases were bad enough. The $10 hornady primer crimp remover works well for smaller batches. I wouldn't want to do a couple thousand by hand with it though, but the cutter head will chuck in a drill or cordless screwdriver. Dillon makes a stand alone nice primer pocket swaging tool. The Dillon 1050 has a primer pocket swager built in. I mix and match crimped and non crimped 45 ACP cases in my 1050. It doesn't blink. Heard it said that the 1050 swager is good for all primer pockets in that it trues them up.